Cars are interesting creatures. They age, their shell ages, their sound ages, and some people laugh at their looks, and then all of a sudden they become classics. And now everybody wants them. Even if you are not a classic car enthusiast, you can still appreciate a nice 1957 Porsche 356A when it drives by you on the highway. Because of this, you may think that an uninteresting classic vehicle is a unicorn – it simply does not exist. It seems like the very term ‘classic’ renders a car interesting, at least in some regard. And yet, there are certain classics that even time has forgotten. But are they truly boring? Or have enthusiasts missed them in their search of worthy vintage cars? Together we will answer these questions, and talk about 5 underrated classic vehicles. Let us start our list with a truly obscure classic. 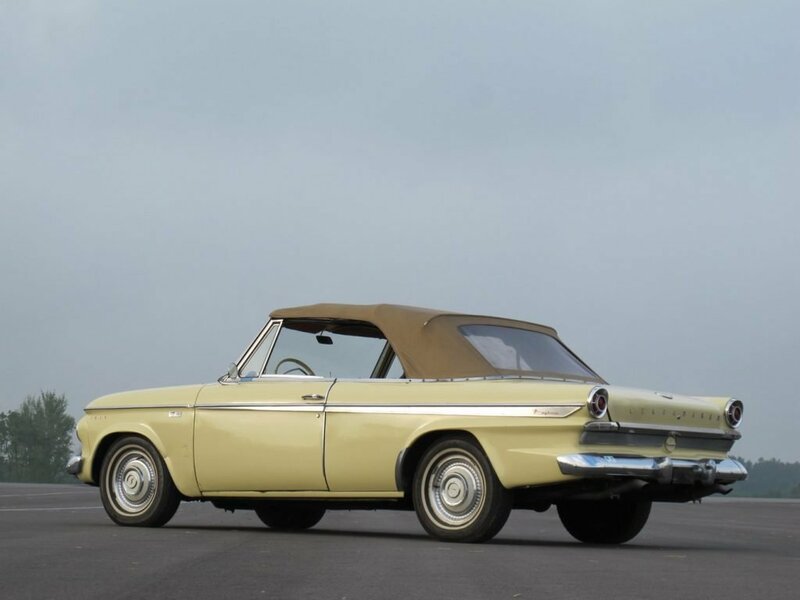 If you have not heard of Studebaker, you would not be the first. Even among enthusiasts this name hardly rings a bell. This car manufacturer never made it big, ceasing all vehicle production by the end of 1963. In a sense, you can think of the Lark Daytona as the company’s swan song. Interestingly enough, that model is not even the manufacturer’s most famous vehicle. If you have ever heard of the company, you probably know about the better-known Studebaker Avanti model. I personally find it very unappealing. The Daytona surpasses it in every single way – from class to sheer beauty. If you want to get your hands on this piece of art, you may have to save up around $14,000. Which is not that much, all things considered. Most classics are well above that and a lot of them lack the charm of the Lark Daytona. Plus, you get bragging rights for owning a vehicle from a company that is no longer in existence. This vehicle is perhaps the best known on this list. However, it still deserves to be included. Because it may have been a bestseller, but people are largely ignoring it now, for some reasons. Why? That really is beyond me. Firstly, the car is very charming. I will grant you that it may not be curvy and it may look a bit rugged. Does that make it unappealing though? Of course not. It still has a style to it. It somewhat reminds me of certain Mercedes-Benz models. Secondly, this is not an American-made vehicle. It is a British piece of history, and that makes it special. The Brits have a very interesting take on vehicles. Currently, their game is not that expansive, but they are famous for their luxury brands – Rolls-Royce, anyone? So TR6 can be your overseas classic for about $15,000 (in good condition). We have already started with non-US vehicles, so let’s carry on with that trend. Now, however, we will focus on Germany. With its heritage in the automotive industry, there is no doubt that a German vehicle is bound to be on this list. After all, with so many cars produced it is expected to have one or two forgotten treasures. The early VW Karmann Ghia models (circa 1958) are now very expensive as their price has skyrocketed in recent years. Yet for some reason, the later models have stabilized and you can get a nice 1970 unit for about $20,000, or even less. Of course, we have to say a bit about why it is the world’s slowest sports car. Part of the reason is its misleading marketing. It was made to be a sports vehicle, and yet it was pretty much a VW Beetle. Its horsepower was in the 30-60 range, which is underwhelming, to say the least. All things considered, you should not be afraid to go after the VW Karmann Ghia. It is a fun vehicle with unique aesthetics. Plus, it seems like the appeal for it will only increase, so perhaps it may make a good investment. How about a station wagon? A 1966 Ford Country Squire? You know what? Station wagons are cool. People in America need to get over their prejudice towards these cars and embrace their utility. Because back in the day, American manufacturers did, in fact, make estate vehicles. We may want to deny it, or not think about it, but that does not make it untrue. The 1966 Ford Country Squire is definitely not a popular classic. It is neither the most liked, nor very famous in general. Is it boring? Maybe a bit. I mean, its aesthetics are obviously nowhere near as slick as other models. It also looks a bit dorky. But perhaps that is where its charm lies! You can find this vehicle at very affordable rates, usually within the $10,000 range. It is likely not the best first classic to have, but if you are an enthusiast it definitely deserves some attention. And as the previous entry in our list, this one may also appreciate in value. Just give it some time. The station wagons may be a bit weird, sure. Yet there is something seriously bizarre about the pickup-truck-wannabe sedans. Now, when you hear that, you probably picture an El Camino. These vehicles are now receiving a lot of love because they are essentially unlovable. But what if I told you that another company did it first? That is absolutely right! The peculiar sedan pickups were done by Ford two years before Chevrolet decided to have their take. Sadly, the Ranchero is now pretty much forgotten, even though it sells at almost the same price as the El Camino. So what does that mean? You can find one for under $20,000, often as low as $15,000. Now, if I have to be honest, this is truly the LEAST interesting classic car for me. I enjoy odd vehicles, but this one is just… Not for me, I guess. So I have to give it the prize for being remarkably unremarkable. So much so that another model (the El Camino) surpassed it in its weirdness. If you feel like you should now look some interesting classic vehicles up, that is awesome. Like I said, they are often a good investment. Plus collecting classics makes for a great hobby as well. As you see, they are not necessarily expensive, and you can find many like-minded people, with whom to share this interest. However, classics are not usually found at the most convenient of places. That means you will have to do some digging to find just the right one for you. Which may actually take you to the other side of the country. But do not worry! There is a pretty easy way to get a car delivered to you – shipping it. We at Corsia Logistics can help you ship a classic car. We actually specialize in classic and high-end automobiles. We have transported thousands of them. We understand that such vehicles require special care. You cannot just ship them out in the open – you have to preserve them inside and outside. Call us now to discuss your shipping options and preferences. Thanks!